One of the biggest problems for newcomers to machining is learning how to grind tool bits and maintain a sharp edge on your cutters. Not everybody can afford or accomodate an industrial type tool and cutter grinder, or spend years building one from castings. These type of tool and cutter grinders are capable of a wide range of operations but are complicated and time consuming to set up if you just want to sharpen a couple of end mills. The Acute Tool Sharpening System has been designed as an easily built and cost effective way to make the shaping and sharpening of a wide range of tool bits and cutters in the workshop as simple as possible. The system is available in several price options to suit your budget. 1. The Drawings - Build it from scratch from 32 x A4 sheets of Metric fully dimensioned drawings and exploded views in a convenient wire binder. 2. The Kit - Items in option 1 plus all materials, laser cut and spot drilled parts, indexable handles, fixings and fasteners, 2 x square and 2 x round insert blanks, pre bent table brackets. "Click here for a detailed list of the contents". 3. The finished Unit - A finished Acute Tool Sharpening System ready for final fitting to your grinder, includes 2 x square and 2 x round insert blanks. Also includes items in option 1. Many sharpening operations are possible. Basic and custom tool shapes up to 3/8" or 10mm square and 1/2" or 12mm round, boring tools and bits, grooving tools, parting blades, round nose tools, form tools, screw cutting tools. The ends of 2, 3, 4, and 6 flute slot drills and endmills, t slot cutters, woodruff cutters. Shanks up to 1/2" or 12mm diameter can be held in the inserts. 16mm shank cutters can also be accomodated by fitting them directly into the tool block and using a square or hexagon collar for indexing. Centre drills, multi flute countersinks, flat bottom drills. Rotary broaches, shaper tools, slotting tools. 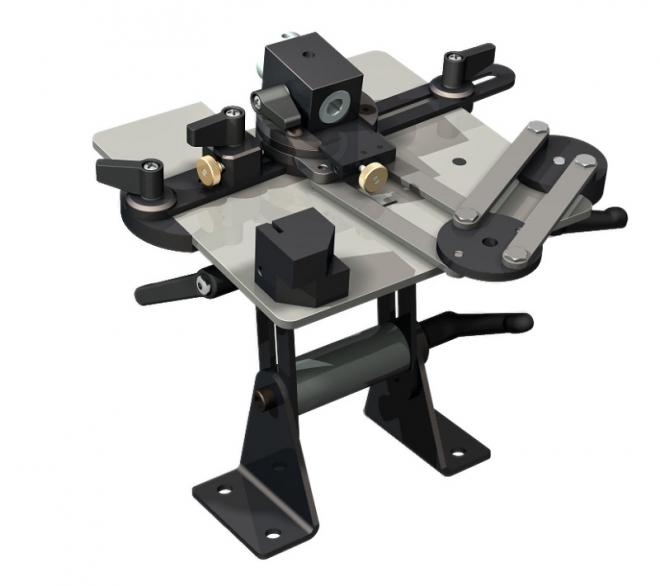 The Acute Tool Sharpening System consists of an Adjustable Table, a Work Arm, a Tool Block and Inserts, and also a Feed Slide and Fence used when sharpening end mills etc. The Adjustable Table can be raised and lowered, or tilted back and forth to achieve the tool cutting and clearance angles, the higher the table is set the sharper the angle. The work table is easily fitted to any standard bench grinder by simply bolting the sharpening table and the grinder to a solid baseboard or benchtop. The Work Arm utilises two pairs of parallel links to hold the work head at a set angle, just set the angle desired for the cutter or tool bit and you can then move the work head all over the table or back and forth across the grinding wheel and it will keep that same angle. The Work Arm can be moved instantly to a more convenient position anywhere around the periphery of the table just by loosening the clamp handle. Easily made templates rather than protractors are used for angle setting as they are quicker, simpler, and more accurate to use than trying to read degrees off a graduated dial. The Tool Block quickly mounts on the work arm and has a 16mm bored hole into which can be fitted a variety of Inserts to hold cutting tools such as square lathe tool bits, milling cutters, centre drills etc. The insert can be rotated in the block to a set angle to give side clearance for lathe tools such as grooving tools. The handy gauge that comes with each kit can set four common front and side clearance angles - 0°, 2°, 5°, 8°. The Inserts come in a variety of types and can be bought ready to use or as blanks for custom use. Round head with an indexing flat - used for round or square lathe tool bits. Square head - used for 2 or 4 flute milling cutters. Hexagon head - used for 2, 3, or 6 flute milling cutters. ER16 collet chuck - used for any odd diameter between 1mm -11mm. The Feed Slide is quickly mounted on the work head and a fine pitch stop screw is used to put on a cut. The Fence comes with a clamp to fix the desired angle, a table clamp to lock it down in position, and a side stop with fine adjustment to align the cutter on the centre line.